I might be a fan of the “more is more” style, but that doesn’t mean I don’t enjoy simplicity in fashion. This spring, one of the major trends is the monochromatic style. Go for either one color or print top to toe. This fashion trend is terribly easy to recreate as you only have to pick a color in your wardrobe and kind of work it. Of course it should be a color you already own for pants/skirts and tops, to facilitate the styling process. It sort of creates a jumpsuit look where little styling is needed to finish the outfit. You can of course add some contrasting materials or accessories, but that will be fairly easy to do as you’ll only have one color to match with. White, red and purple are three popular colors to work top to toe this season. I think this is the third or fourth time I write about the midi lengths in a trend report, but that’s just a sign that the timeless length isn’t going anywhere anytime soon. The midi skirt has been immensely popular the past year, often done in the pleated style or high-waisted. It’s also safe to say that you’re trendy and timeless when working a floral midi dress. What to think about when working the midi length is to choose simple shoes! You can catch some ideas on the look in this article. Well, the 1980s are still going strong and so are the bold colors. In fact, the bold colors will join us for fall too, which will be a nice contrast with the regular, dove, fall colors. Red was the hottest color last year and purple is stated to be the most popular color of 2018. I wrote about the spring colors in this article earlier this week and I think all three of them are relevant, approachable and easy to style this season. You can either go full monochromatic as mentioned above, or keep it more subtle and let the bold color be a pop of energy in an outfit, done by a top or an accessory. 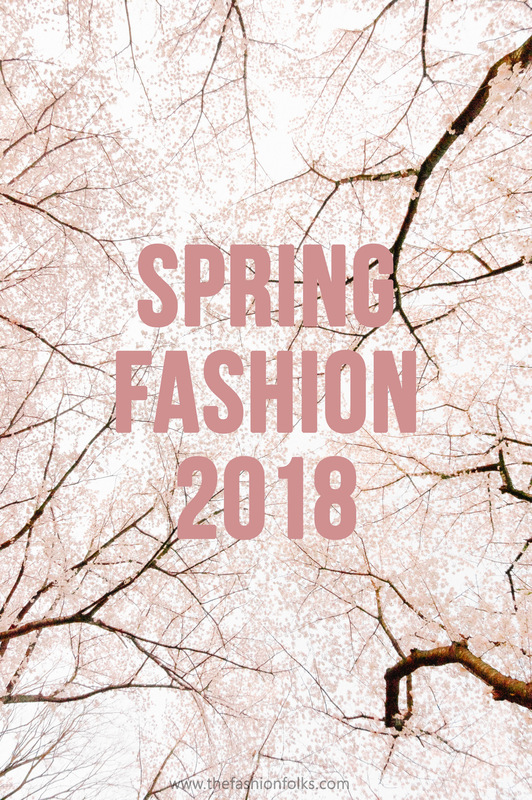 Catch this article on 50 outfit ideas spring 2018, for some ideas on how to work the bold colors 2018! Another 80s statement that is a statement indeed is the blazer statement. The blazer is a timeless staple, but is extra popular at the moment, almost replacing the beloved leather/denim jackets as the final layer in an outfit. The blazer look works well when you want to add some structure to an outfit, or you need to work the formal dress code. A black blazer is a piece I think everyone needs in their wardrobe, catch the article here, and is a clothing piece that will work well for spring. I believe a blazer with the midi length will give a chic contrast and also one that’s chic to layer with a monochromatic outfit. Don’t forget to go for the shoulder pads if you feel like embracing the full 1980s mood! I’m allowed to bring up mini-trends here, right? The transparent elements are another trend that’s happening at the moment. It might not be as big as the monochromatic style, but it’s relevant enough to put it in the spotlight. The transparent elements are about clothing pieces or accessories that are see-through. Either done by the plastic material, as in Calvin Klein or Chanel, or done with a soft, light-weight material such as tulle, mesh or even lace. The idea with the transparent elements is to work your regular outfit but let the transparent style be the final layer. By doing so, you create a fashion statement without working too hard with the styling part. Perhaps a transparent dress over your regular outfit or a raincoat to protect your outfit on rainy days? Well, I’m here for the style! I have seen many of these trends in blogs, editorials and social media but I feel like they have a long way to go and I really want to take advantage of many things like block colored outfits and especially statement blazers. Not sure how designers are going to give them a special twist or an upgrade in the upcoming season but hopefully blazers can stay here for many months, feel like I can pull off a very good outfit out from a statement blazer and a basic t-shirt! midis is my favorite on this list! I really wanna try out more this season! I’ve been loving the monochromatic outfits I’ve seen lately, especially all white! It’s so chic! Have a great start into the new week, Mia! Oh I am so into monochrome looks lately! And yess for those transparent looks (if you check out my latest post you’ll know why I love this trend!). Such a perfect round-up! I love the monochromatic outfits! Especially orange. What do you think of Ultraviolet? I am in love with the bold colors part! Amazing post!! Ive seen monochromatic outfits and midi lengths everyone, its true!! I can’t wait to try out a full white outfit, I don’t know how its going to look on me! And I also got a few transparent pieces, but still haven’t found the occasion (and the courage tbh) to rock them out! I have read so much about blazers coming back in recently, and bold colours are always my favourite. They’re two of the most timeless pieces and styles and yet I’ve noticed they tend to come back to the streets in waves? Love this post. I love the statement that a monochromatic look can make. I need to look at my closet and see if I can make that happen! I also love a good blazer and need to find one that is a little oversized like the one you have featured here. I’m HERE for midi lengths! After years of disliking them, I’ve now completely warmed to them and love how flattering they can be on anyone and everyone’s frame! Love your suggestion of monochromatic styling this Spring too – such a trend and one I’ll no doubt be wearing throughout these upcoming warmer months 🙂 Have a lovely weekend Mia! Monochromatic outfits look really good! I might be able to pull off white and black but no idea about the other shades though.